www.malaysianidentity.com :: View topic - Do we need to Brand Malaysia? Post subject: Do we need to Brand Malaysia? Post subject: Branding Malaysia ? Branding Malaysia as a country, we can foremost look at the Tourism Industry and their way of depicting or branding the country in their various TV/Video clips. The 'Visit Malaysia Year' repeats itself every year, with next year's header or main topic being the 50 years of independance celebrations on 'Merdeka Day'. Quite obvious a full range is shown here, basically from one extreme to the other, emphasising on the great variety and diversity of and within the country, with underlying hints of Malysia being a stable and peaceful country. I'd call it quite smart way of branding. The goverment promotes Malaysia to the international level showing that Malaysia ia peaceful and stable country..which is good...but do the goverment make an afforts to promote/brand Malaysia internally? I mean branding Malaysia for Malaysian... I dont know if we need it or not...perhaps it's good to look at..
That could become a 'spicy' topic. Branding Malaysia for Malaysians is sure not an easy task. For most Malaysians and Malaysian companies whatever comes from overseas is considered better, more style, more class, more no matter what - and hence bought because Malaysians consider themselves (mean their products) as too low in the value chain. Start for example with the mega projects past few years, starting with the architect until prime contractor, that must be foreign companies. Oh yes, contracts are given to (few cronies) Malaysian companies, but who does it ? At the end, it's 'outsourced' to the foreign principal. Malaysians making holiday in the own country, that is generally reserved to those having a tight budget not permitting to go overseas. leaving skiing and snowy mountains apart, Malaysia got (almost) everything in terms of holiday relaxation, but no, it must be Europe, USA, Japan or else. I'm not focussing about visiting other countries for studies or knowledge and history or similar purposes, just only on the so-called holiday for purpose of relaxation. When it comes to products, same applies in even greater scale. It absolutely must be the 'imported' brand (via Singapore some more, the hell with it) from a major European country, because it has a "certification" from a laboratory for example. That a Malaysian product could be actually better (e.g. for nutrition) is far beyond of the minds of many Malaysians. Soon we are going to have - following Japan - an obesity problem here. Look at the numbers flocking into all the KFC's, Pizza Hut's and alike. It's foreign, it's style' it's class, and as Malaysian I wanna be seen there. "Gurney Drive" ?? - that's for the tourists. Ok, before I continue ranting, maybe I should invite a few more comments first - LOL. This is my first post on this forum. It's interesting to read this thread. From my point of view, the situations described in the thread is common among many asian and developing countries. The tension always comes in to how do we want to portray ourselves (local identity) to the world while trying to communicate in an 'international' language (globalisation). At this point, it is a tough job for designers to find the balance between the two. Or even in a more fundamental level, can we actually differentiate what is local and what is global? In the search of our idenity, there is as well another tension: while we continuously try to brand ourselves and communicate with people outside of M'sia, other countries are doing the same to us - we are at the same time consummers of identity from other countries. I can never forget seeing youngsters wearing thick beanie hats and bubble jackets in a packed LRT heading to KLCC. From a design and communication point of view, promoting and branding a country can be that tricky. However, designers (of any kind) need to now look into the rapid development and evolution of meaning in our society. Welcome on board Chris! Very interesting view. It's hard to define branding, worse is to think about the purpose of branding. Depending to which context we're looking at. As a comunication designer and a consumer, I see most of branding process as seduction or what people call now marketing. Most of the time in the marketing process, the intention is to show the good part, of course the opposite part is just silently hidden...or not mentioned. It is very tricky i would say.. However, I do believe it's part of designers' roles to accept or not this situation. It is difficult to change mentality and this process might take years. It's 'funny' how Malaysians value the fast food..if we really want to be seen as 'international level' why most of the Malaysian prefer the fast food, whereas most of developed countries are against and try to get rid of this industry. Coming back to the topic, how do we, Malaysian want to portray ourselves? Why Malaysian admire the imported brands? Why not made in Malaysia ('Buatan Malaysia') ? Selamat Sejahtera... to begin with. its a nice effort u got here. but why the sudden 'fast food' analogy? as for branding. i believe in quality. the hell where it hails from. but its not that bad nowadays here in our good ol' malaysia. we have 'modified kopitiam' that charges shitload of money just for a teh tarik and a karipap. but hey! if we can spend 10 bucks for a starbucks coffe.. why not 2-3 ringgit on teh tarik right? its all about perception and branding. ppl always think that the grass is greener on the other side.. its just human nature. just to share, i went to a shopping complex just the other day. near my place. there's this one shop that sells wine. actually its like a cafe. and they name it "Winter Warmers". i was like. what the heck! i know why they call it that. but look around! unless u sit in an air conditioned room the rest of ur life. its bloody friggin summer all year round. to me? plain ignorance. anyways, i'm just babbling here. just disregard my post if it doesn't give u any intellectual input. Post subject: Welcome on board Zul! It nice to see what Malaysian think about Malaysia, further more, it interesting to see how non-Malaysian view Malaysia. After all, that is the reason why we have this forum. Let's openly write what we like and what we don't like about Malaysia. I know it can be very personal and subjective, but let's try to keep it in the topic of branding. What do Malaysian needs and wants for itself and what Malaysian wants to communicate to others? Just something to start with! These are some of the products that have potential to be part of branding Malaysia; places, cuisine, culture, tradition, heritage.....what else? My view on these is that Malaysians (and I suppose everyone else) consume in two levels: for object and for process. We buy things as object for its basic function. For example, clothing to cover and protect ourselves, and food to satisfy hunger. However, we also consume these items as process. For example, buying and wearing an internationally known/branded jeans show that one belong to a certain level/group of the society; drinking coffee in Star Buck gives one a different �identity� from drinking RM1.20 kopi from corner kopi-tiam. So if we understand these two levels of meaning occurred among Malaysian consumers, we can easily answer the questions �why Malaysian admire the imported brands? Why not made in Malaysia?� This is because that when the product serves the same function (as an object), people will start to make choices based on the product�s process. In other words, when Malaysian consume imported goods, they are buying the �image� of these goods: I'm cool and 'look like' people in MTV when I'm in my addidas shoes. So perhaps we can look at the situation from a different point of view: what kind of �image� are Malaysians looking at when consuming an item? That brings us back to my earlier post on global vs local identity. There�s now simply a myth that international brand is �better� than local brand. So if we look even further into this issue, the question will be: What image can local brand portray that will trigger �want� from Malaysians? Well I�ll stop here this time. I suppose what I really want to say this round is that maybe we should tackle the issue from looking at the �process� of things rather than the �object�. I leave this one open for discussion. I plan to be back soon talking about myth and ideology, and probably hyperreality. Hi all, it's great to read what others think about Malaysia. As a respond to chris, discussion what is happening in Malaysia, I think it's the developing countries symptom. We buy things as object for its basic function. For example, clothing to cover and protect ourselves, and food to satisfy hunger. However, we also consume these items as process. For example, buying and wearing an internationally known/branded jeans show that one belong to a certain level/group of the society; drinking coffee in Star Buck gives one a different �identity� from drinking RM1.20 kopi from corner kopi-tiam. These is the reality scenario in Malaysia. I think that what Malaysia need is to understand the quality of the object not only by the name/ 'brand' but the process of making the product. Thanks Proton for the reply. 1) process of making: this deals with 'how do we make things'. 2) process as in-use: this deals with 'how do we use things'. My previous post deals with 2). What I was trying to say is, when we buy things, we at many times are not buying them just for their functions as objects; we buy them for their 'processes'. When we buy Star Buck, we consume the 'idea' and 'image' that we belong to a higher level group of the society that is always linked to the international standard. So in this way, we are consuming the 'process' of being at a 'higher' standard. I welcome any comment on this. Just responding the 'hot' topic, do we need to create this 'level' in the process as in use, the way we use things. Just looking at from designer point of view. I mean, I feel responsible to the end-user, as being part of creating the 'level' when I participate in the process. Thanks for the feedback. Just wondering what 'level' are you referring to? You are referring to the level of designers designing 'image' rather than object, I think it's not in our control to stop doing so. The entire world is already functioning in such way. We (designers and users) all consume and interact with image more than the actual thing. That's how the society developed since the first industrial revolutioin. And not to mention this time around, we are looking into the revolution of information. 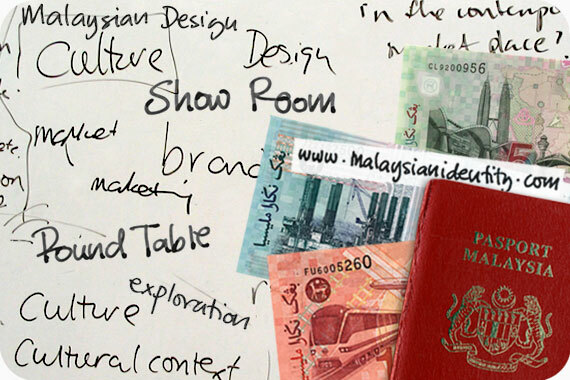 Before I get on too far, let's pull this back to our original discussion: Branding Malaysia - product or process? p/s: do let me know if I started to say things that seem redundant and irrelevant. I still think designer's have the power to help changing the evolution of 'image' culture. Yes indeed! you'er right by saying that world is already functioning in such way, it's been evolved and move but I think as designer (in any kind), we should consider playing our roles in 'creating' the process, not just follow. I do think this topic have relation to 'branding Malaysia-product or process.' I'm happy with your post, Chris and I find it very encouraging, full on. I'm fine with spitting out our thought and discuss about it. It ok to have different opinion. This is for the guest whose visiting this site, it's ok if you want to write in Malay, it's not that the whole discussion have to be in english. Anything that you're comfortable with. Totally agree. I believe in quality and good value too. No matter where it is made, who made it, where it came from, price or whatever. There is a very wide difference in the variance of why one would get something but not the other. There is no black and whhite in this matter. The real issue is identifying the 'shades of grey' and trying to thread the thin line between black or white. Is not one thing only or the other really. Again not everybody can be 'impartial' when looking at things.